About Us - Healing Companions, Inc.
Healing Companions, Inc., is an Oberlin, Ohio-based nonprofit organization. 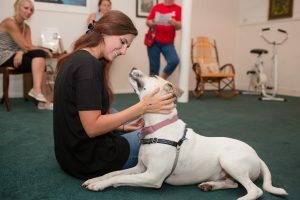 We work to raise awareness of the benefits of psychiatric service dogs and provide them to qualifying residents of Northeast Ohio who suffer from mental illness. Our program helps individuals who are severely limited in their ability to function live with dignity, productivity, freedom and self-reliance. Our founder, Jane Miller, is a licensed psychotherapist with 20 years of experience working with psychiatric service dogs. In the mid-90s she began training psychiatric service dogs to help her clients suffering from debilitating mental illnesses. 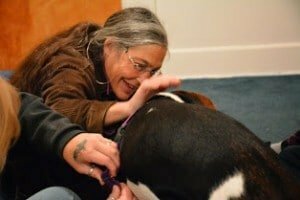 After years of observing these amazing animals rebuilding her clients’ lives, she went on to found Healing Companions, Inc. in 2013 to share the benefits of these dogs with more people. We aim to educate the public about the benefits a psychiatric service dog can offer those suffering with mental illness, and inform health professionals about the legal, ethical, and psycho-social impact of these wonderful animals, and how they can be integrated into mental health care. Jane Miller, LISW, IAABC-CDBC & AABP- CDBT & Founder of Healing Companions, Inc.
A psychiatric service dog, or PSD, is a dog that has been specially trained to assist the mentally ill person to be able to function out in the world, navigating their way through activities of daily living and providing the person with opportunities that they previously were incapable of achieving. Depending on the individual’s disability and specific symptoms, PSDs can be task trained to guide a handler disoriented by anxiety, conduct a room search to alleviate fear of intruders or the unknown, provide assistance in locating an individual’s car when dissociating, interrupt a panic attack, obsessive compulsive behavior and/or nightmares, among a variety of other tasks. The tasks that the PSD is trained to perform allow individuals to go out into the world, hold jobs, study, develop healthy relationships, and essentially become able to cope with the ups and downs of daily life. The value of having a healing companion, however, goes beyond having the dog perform specific tasks. The client’s participation in the training of the dog is an empowering experience in itself: one based on deep emotional bonds and a respectful professional relationship. Our clients gain confidence and life-skills when they commit to the care of another living creature. In this life-changing process, individuals who are normally unable to take proper care of themselves become aware that they are capable of caring for another living being. Clients experience a renewed sense of self-worth and willingness to engage in life when they take care of their PSD. Is a Psychiatric Service Dog right for me?